LONDON, England (CNN) -- Israeli attacks on suspected Hamas strongholds in Gaza have triggered protests in more than a dozen countries. 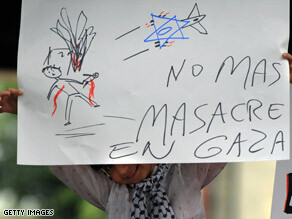 A girl in Caracas, Venezuela, holds a sign reading, "No more massacre in Gaza" at Israel's embassy Monday. The attacks entered their third day Monday, with more than 300 people in Gaza reported killed and hundreds more wounded. Israel says the military assault is in response to ongoing rocket strikes on Israel, which have killed two Israelis. Protesters hurled stones in an attempt to break through the police cordon around the heavily secured embassy. Police responded with tear gas. Also, thousands of Lebanese demonstrators packed the streets of Beirut as part of a rally called by the militant group Hezbollah. Hezbollah leader Hassan Nasrallah addressed the crowd via satellite from an undisclosed location. Protests were also held in Israel, where students at universities in Haifa, Tel Aviv and Jerusalem demonstrated against the Israeli military operation, ynetnews.com reported.